A new version of MSI Kombustor is available for download. 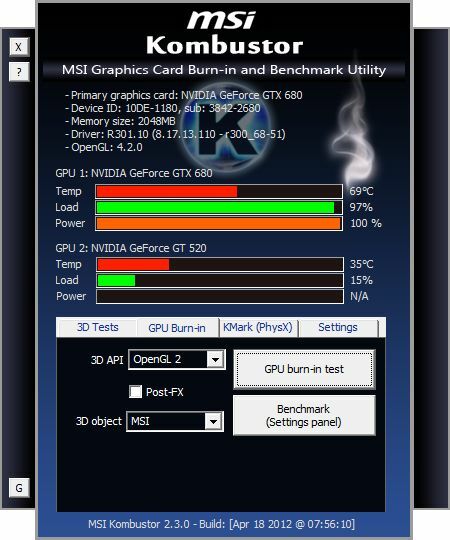 Kombustor is MSI’s GPU stress test and graphics card benchmarking tool (for NVIDIA GeForce and AMD Radeon). More information about Kombustor can be found HERE. The main new feature of Kombustor 2.3.0 is the support of the GeForce GTX 680 (clock speeds, power monitoring as well as some small changes in KMark PhysX code). New: added GTX 680 current power consumption in the main interface. New: support of NVIDIA GeForce GTX 680 (clock speeds, power monitoring). Update: PhysX code (KMark benchmark) has been updated to run with NVIDIA Kepler-based graphics cards (GTX 600 series). Update: minor changes in the interface. Removed the Xtreme-burn-in mode. Now there is only one mode with reasonable heavy load. 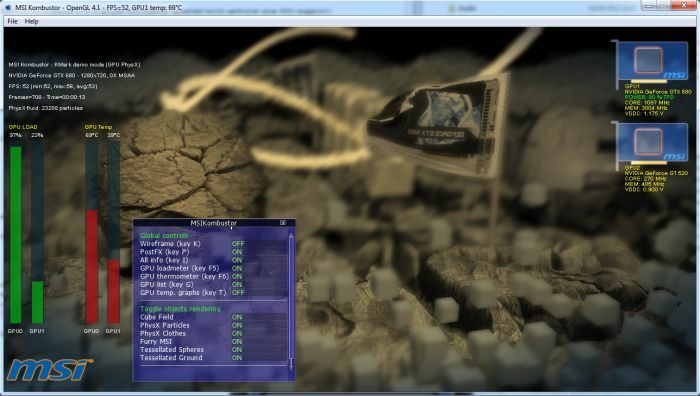 Update: compiled with ZoomGPU 1.8.2 (support of latest Radeon HD 7000 and GeForce GTX 680). Bugfix (fixed on April 26 2012): kdata.dll loading failure under WinXP. Fixed with a recompilation (using a different compiler setting). Finally. 2.2.2 would crash or not display the PhysX flag on GPU PhysX with the GTX 680.
i used it with gpuz and gpu shark and i have strange results under win7 x64 , with xp x64 it is a bit strange but less..
few days ago i installed xp x64 and win 7 x64 with latest drivers for my mainboard tyan s7025 that has 2 cpu and 2 hd 5970 plus a gtx 570..
i tried a lot of registry tricks to have 4 gpu enabled in crossfirex with win xp , while gpuz says they are under win 7 . problem is that perf are not . i tried the futurmark renaming and fps were higher but not stable at each run . with xp when server load a new map : pc reboot ..
for the part where i wrote : with xp when server load a new map : pc reboot ..